First, you should check crontab log to make sure crontab runs normally. Is mono-gen in your $PATH? You can check with this command: type mono-gen.
You should find the logs in /var/syslog. In your particular case, I am fairly sure the issue is that mono-sgen is not in cron's path as suggested by Gnouc but these are useful tricks to know for next time. The @reboot can be problematic depending on what distro you're using. See this U&L Q&A I wrote up about this very issue, titled: crontab's @reboot only works for root?. Rather then mess with a crontab entry I'd be inclined to put a script together that can be run as part of you logging into your desktop environment (DE). 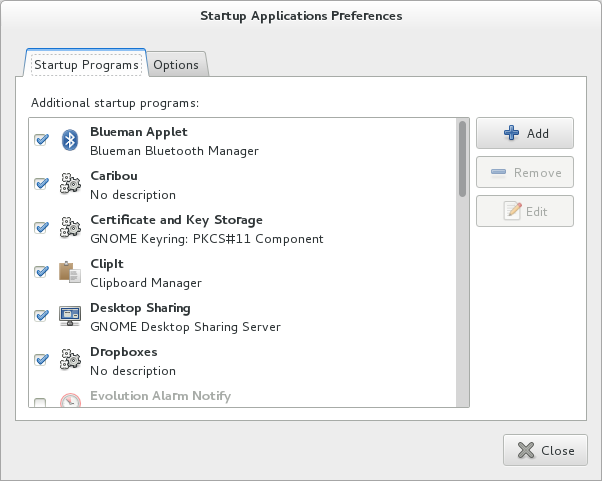 This can then be added as "Startup Programs" via gnome-session-properties. For modifications to your script see @Gnouc's answer. Isn't it cleaner to put this in rc.local (or equivalent)? It's the standard way of doing things after boot. It's better, because it's not called when cron wakes up (which is in the middle of boot procedure) but after all the services are running. It's also more robust. If you want logging you can still use "logger" command. Also, the script may have started, but failed after a moment and is thus not seen in ps. Why does my cronjob not execute my shell-script? Why does my cron job not work?